Tamiya de Havilland Mosquito FB.IV in fighter-bomber camouflage, on an Airfix stand. For fairly obvious reasons, plastic aircraft models are typically assembled with the aircraft standing on its landing gear/skis/skids/floats/whatever. However, long ago, if the subject I was building had retractable landing gear, I often built it with gear up, and carrying a pilot. I didn't bother with using the stand that often came with the older aircraft kits, either; I just rested the model on its belly on the model display shelf. When I got more serious about building my models as accurately as I could, I always built the kit with the gear down, usually without aircrew. There are many beautiful prop airplanes in history: the North American P-51 Mustang, the Supermarine Spitfire, the Mitsubishi Dinah III, the early marks of the Dornier Do-17, the list is long and highly subjective. I think the de Havilland Mosquito is just about the most elegant and beautiful prop plane ever designed. It's a shame to mar its clean lines with protruding landing gear and open landing gear doors. Having built two Tamiya kits of the Mosquito FB.IV fighter bomber (gear down), I felt nostalgia for my more relaxed, carefree model building ways of yester-year, and decided to build yet another Mosquito FB.IV, my third, this time in flight. I installed the landing gear doors closed (surprisingly for a Tamiya kit, the doors did not meet at the centerline, requiring slivers of Evergreen plastic to seal up the gaps.) I assembled the props and spinners and chopped off the prop blades, filling the gaps in the spinner openings with more Evergreen bits and super glue, sanding away until the spinners were smooth and, well, spinning. The camouflage paint scheme was a long excursion. Having done the two-color "Day Fighter" scheme twice already, I opted for the three-color "Fighter-Bomber" scheme for this Mosquito. For scale effect I mixed Testors Model Master Flat White with the two upper colors, Testors RAF Dark Green and Testors RAF Ocean Grey, and airbrushed samples on separate rectangles of Evergreen plastic, then applied Future Acrylic Floor Finish (to receive decals without silvering), and then Testors Clear Flat Lacquer, to preview how the paint would look on the finished model. I thought I was satisfied with the results. 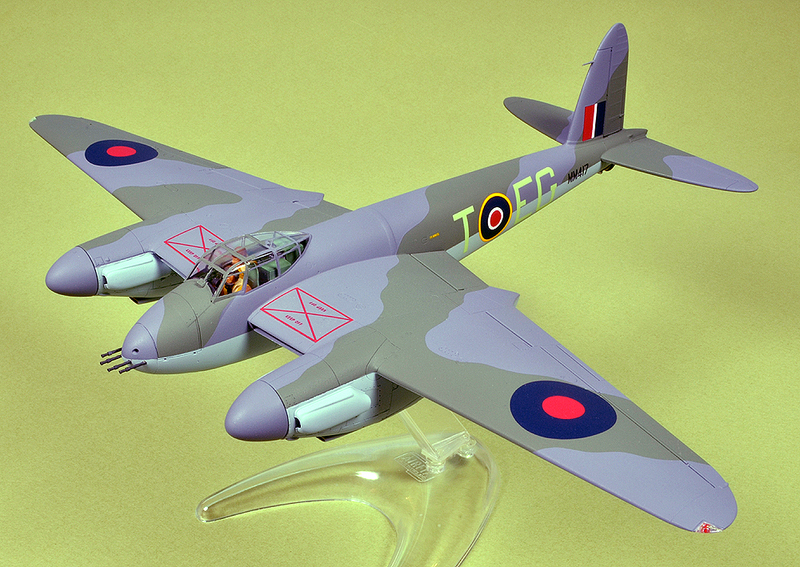 I airbrushed the undersides of the Mosquito with Testors Model Master RAF Medium Sea Grey, masked the undersides, airbrushed the Ocean Grey, masked the Ocean Grey and then airbrushed the Dark Green. Once all of the masking was removed, it became obvious to me that there was way too little contrast between the Dark Green and the Ocean Grey. Not sure how that happened. I thought long and hard about how to fix this, even to consider building a whole new Mosquito, but in the end, I decided to try and mask the Dark Green and Medium Sea Grey areas and airbrush a new coat of much lighter Ocean Grey. I used a new-to-me Tamiya product called Flexible Vinyl Tape, to oh-so-carefully follow every twist and turn of my earlier camouflage masking with this Tamiya tape, which I had slit into long pieces about 1mm wide. Success in the end, I think, but what a detour. For once I used the kit (Tamiya) decals, and they worked quite well. This being my third build of this kit, I judiciously sliced away or sanded off much of the raised details that were going to be problematic at the decal locations. I added MasterModel turned brass .303 Browning machine gun barrels to the nose, and a brass pitot tube to the rudder. The canopy was masked with the Eduard set of Kabuki tape masks. The final coat was Testors Clear Flat Lacquer. Once the model was photographed, I Photo-Shopped the images to correct for color balance and to erase the clear plastic Airfix stand (see the model photo above for a picture of the stand). Click on the thumbnails below to see larger images.